It’s a common mindset of bloggers to be hesitant spending money when starting a website. They will find shared hosting as a perfect fit and start with a WordPress blog due to cheap pricing. Nowadays it only cost few dollars per month to get shared hosting with lot of additional benefits. Also migrating from one host to another is a real headache, which needs all the analysis needs to be done again. Everything may not work as you think if you do not understand your needs before going for cheap hosting. Especially migration of an existing site to a new host needs lot of analysis. 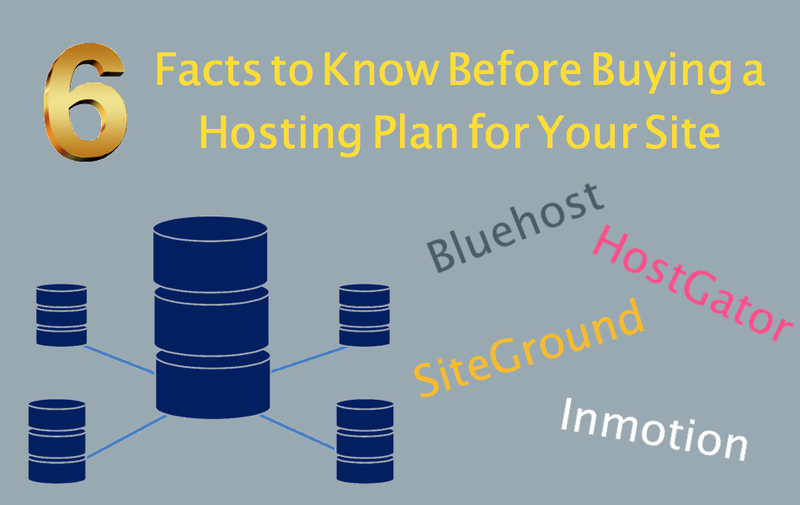 Here is a checklist of 6 facts you should know before buying a hosting. Do you need a free domain? Offer price is not the real price? Well, do you need it? Certainly not in most cases. The catch is that the domain will be free for first year and you will be charged at the highest price for extending it. You can always buy domain separately from domain registrars like GoDaddy for longer term on cheaper price. Then change the nameservers pointing to your hosting servers. In this way, you have a long-term commitment with your domain name and even if your hosting is expired the domain name will be with you. Take an example of Bluehost. The free .com domain after a year will cost you $15.99 and the domain privacy will be at $11.88. You need to pay approximately $29.87 for renewal of the free domain with privacy option. The calculation will be like this when you buy a .com domain from GoDaddy. The first year actual price of a .com domain on GoDaddy is $2.99 with renewal of $14.99 for remaining years. This is $1 less than Bluehost renewal cost. The domain privacy is more cheaper for $7.99 per year while $11.88 on Bluehost. Do your math before thinking of registering free domain with hosting companies. Look at the price tag carefully!!! All the low offer prices are generally valid for first term, first month or first invoice. No hosting company will offer you a $3 per month hosting for life long. Take an example of Inmotion Hosting. The lowest launch shared hosting plan starts at $5.99 per month mentioning 25% off. Click on the order button to see that you can get that price only on 24 months contract. The renewal will happen either at $7.99 and you should again lock in for 24 months contract. Also note the pricing logic will change based on the referral links you use and for VPS / dedicated servers. Most of the companies follow this locking trick. In most scenarios, you will regret your decision of going for long-term contract without testing the features. Believe us – every site is different. You should not rely on the reviews written with affiliate links with the objective of getting commission. 99% of the reviewers never use the platform and write the duplicate content with referral banners and links. So apply your mind before going for yearly contract. Always try to choose short-term plan for first time till you get satisfied and keep an eye on the renewal price. No free lunch in this world. Especially on shared servers, guaranteed your account will be banned for violation of usage policy. You need to understand the facts of shared server before buying the hosting plan. When one of the sites use high CPU / RAM, all other sites on the server will get impacted. The problem is you may not know what you are doing unless you receive an email on policy violation. A simple example is using W3TC caching plugin on a shared server. This plugin will create tens of thousands of directories based on the settings. You have options like page cache, minification, browser cache, database cache, etc. And each option will generate huge number of folders on your server. Most of the shared hosting plans will have a limitation of number of directories under the wording of “unlimited”. Hence, you will violate the policy when W3TC creates huge number of directories. 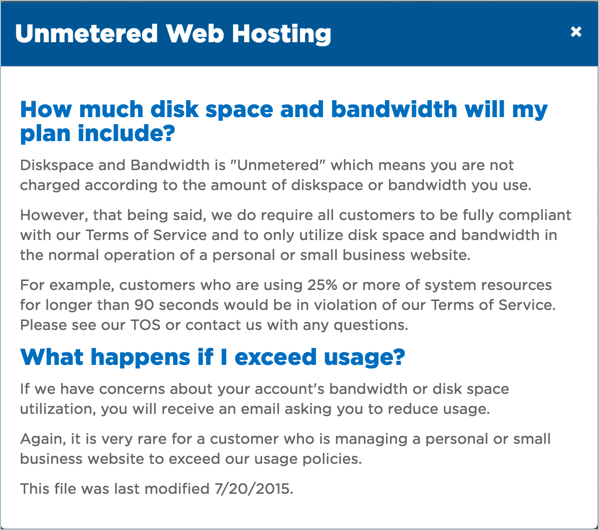 Ensure to read the terms on unlimited usage before buying a hosting plan. There will be lot of offers throughout the year on different occasions like thanks giving day, cyber Monday, black Friday, etc. When you already have a hosting account, be careful on these special upgrade deals. Its like a one way, you only can upgrade using the offer and can’t downgrade back even you don’t need it. 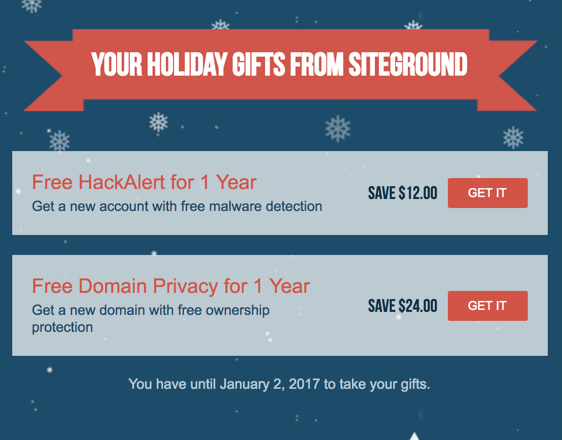 Below is the example from SiteGround and the offers are actually displayed inside the hosting account. When you upgrade there will be no downgrade option (especially on storage space related stuffs). 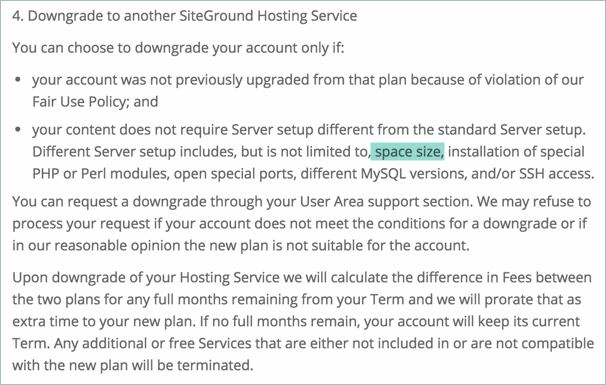 Below is the terms from SiteGround indicating the no possibility on downgrade. At least SiteGround guys are approachable and at the best case, you may need to raise a ticket or discuss with customer care to downgrade again. So control your clicks when dealing with hosting related stuff. Each wrong click may cost you hefty amount from your pocket. 5 things you should know before buying SiteGround WordPress hosting plans. What you pay is what you get. Paying low on hosting server and spending too much on speed improvements is one of the hobbies of bloggers. There are many tools to see the server response time. Use Google PageSpeed Insights and see the server response time will be on top priority issue for sites hosted on cheap platform. Set your expectations correct!!! Choosing shared hosting plans from HostGator or SiteGround and expecting 95/100 speed grade is foolishness. Of course this will work when you have only 10 pages on your site. Complex sites growing fast with complicated plugins like subscription, social sharing, site builder, related posts, sliders, etc. need sufficient server resources to load faster. Again every site is different. So never look on the reviews done based on the plain twenty seventeen themes with bare minimum pages. In reality, even if you are launching a new site, it will grow faster and start attracting large number of traffic (both human and bots). Notice the quality hosting platforms like WPengine charge based on the number of visits. So pay more and get good quality. Everywhere on the web people talk about low support quality of the EIG hosting companies like Bluehost and HostGator. It’s an irony that they are the largest hosting companies in the world. Even WordPress.org site officially recommends Bluehost for more than 10 years. The funny fact is that EIG is the owner of both Bluehost and HostGator. So frustrated customers moving from one of these host to other will have no impact on their total customer base. Below is the waiting screen from HostGator live chat. It took more almost 10 minutes to get the guy online. And we can clearly see they search online and the knowledge base when asked simple questions. On the other hand, companies like SiteGround setting an excellence in supporting standards. So if you are a beginner and expect everything from customer care then check out the support system before buying the plan. Take some time to analyze your needs and the available hosting platforms. Do not get lured with “FREE” and be ready to pay for getting good quality things. It does not matter if the hosting company offers 300 applications. You will never use most of those applications and what you need may be only WordPress, which can be installed on your own. Do not follow the reviews written with affiliate links – it can’t be a real review when they themselves recommend using the product. Above 6 facts are only major things most companies do the trick to trap you. Always take a monthly or quarterly plan, test yourself and then go for long term when you are satisfied. Good article. I bought hosting with 36 months contract. Unfortunately it was not working out for me and need to look for a new host. Waste of time and money. I believe in Google Blogger where everything really is free and you don’t need to buy a plan to use a domain name. Although blogspot is ‘bloggerish’ that doesn’t mean it has to stay that way with so many howto’s around to change the template. When you think of creating a site getting decent traffic, say 5000 visits per day, definitely you will not choose free hosting platforms. Starting with free might look attractive but for long run “FREE” will not work.